Through Marvel Comics’ history there have been many civilizations introduced from Earth and beyond the stars, but it can be argued that no other civilization has had a more profound effect on the Marvel Universe than the Kree. In August of 1967, Stan Lee and Jack Kirby introduced the Kree to the world in Fantastic Four #65. The main antagonist from the Kree army was Ronan the Accuser, perhaps the most famous Kree of them all. Over 6 million years ago lived the Xorrians and Progenitors; these godlike terrestrial beings allegedly created all humanoid forms from their DNA, including the Kree, the Skrulls and Humans. The Progenitors and another godlike race, the Celestials, experimented on different types of Kree; the Progenitors took the prehistoric Kree and engineered them by using Primagen (or Prima Material), which resulted in the very first race of Inhumans. The Celestials experimented on the ancient Kree, and their results created the Kree Eternals and the Kree Deviants. Before the Kree had an empire, they lived peacefully with the plant-like alien race called the Cotati on the planet Hala, located in the galaxy called the Large Magellanic. Both races had their differences; the Kree were more ambitious and warriors,whereas the Cotati evolved on Hala and were a pacifistic race. Over a million years ago, Hala was investigated by the then-peaceful space-faring race, the Skrulls. 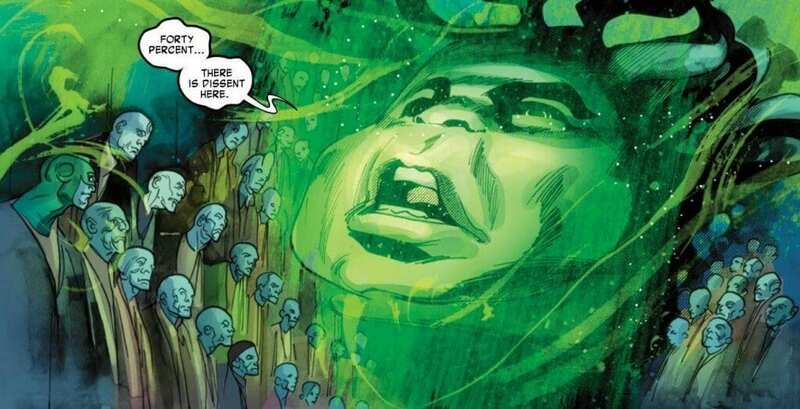 The Skrulls had a vast trading empire, and visited Hala with the purpose of educating the natives so they too would become a part of their empire. They proposed a test to determine which race would be worthy, taking members of the Kree and the Cotati to a distant planet in another galaxy where they would have a year to create something of worth. The Kree built a glorious city while the Cotatis created a spectacular garden. After a year, the Skrulls returned to give their judgement and declared the Cotatis the worthier race. Outraged by the decision, the Kree murdered the Skrulls and Cotatis before stealing the Skrull starship and returning to Hala. Upon arriving on their native planet, the Kree started deciphering the technology of the Skrull starship. Within a hundred years of acquiring interstellar technology, the Kree began building an empire that would quickly spread throughout the Greater Magellanic Cloud and sought revenge on the Skrulls. The Kree declared war against the Skrull Empire; this war would rage on for hundreds of years, and the Cotati on Hala were almost driven to extinction as a result. However, a small handful of Kree hid and protected a group of Cotati. These Kree eventually began to worship the Cotati and, to further conceal their identity and keep them safe, they relocated the surviving Cotati throughout the universe. At the beginning of the war, the Kree Empire established a base on Uranus, there they discovered that sentient life on nearby Earth had genetic potential invested in it by the Celestials. Interested in the genetic possibilities, they began to experiment on Earth’s pre-humans. Their intentions were to investigate possible ways of circumventing their own evolution and to create a supreme mutant race of soldiers; instead, their experiments were successful in creating a small part of humanity with exceptional and varied abilities. The Kree secretly surveilled their creation for some time until the experiment was completely abandoned after the Kree government decided the Earth was a minor, limited-potential planet of little importance. This strain of humanity went on to form their own society, which lived and thrived in secrecy from the rest of humanity; they called themselves Inhumans. The Kree have been a part of some of Marvel Comics’ biggest storylines. Their presence went beyond the page to screen as Ronan the Accuser, played by Lee Pace, made his debut and met his unfortunate end in Guardians of the Galaxy. Big props need to go to James Gunn for throwing the decapitated head of a Celestial in that movie too. The Kree are also featured heavily in Agents of S.H.I.E.L.D., as are their creations, the Inhumans. But perhaps the Kree Empire will be most represented in Marvel Studios’ Captain Marvel. Brie Larson will be playing former air force pilot Carol Danvers, who becomes Captain Marvel after an encounter with her Kree lover, Mar-Vell, also known as the original Captain Marvel, and his mortal enemy, Colonel Yon-Rogg. That, however, is a tale for another time. To learn more about the Kree before Captain Marvel hits theaters, visit Marvel.com. Agents of S.H.I.E.L.D. seasons 1-4 are available on Netflix US and Amazon Prime UK; season 5 airs every Friday on ABC and every Sunday on E4. Marvel Studios’ Captain Marvel gets its theatrical release on March 8th 2019 in the US and UK (Release dates is subject to change). Why is the Comics Direct Market so Important Anyway?